LE17 Milagro Blanco from La Mancha, Spain is now available at Just Fine Wine. If you pre-ordered this limited edition, please drop into the shop so that we may take care of you. March already!?! Time sure is rushing by. 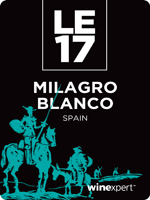 The silver lining is that LE17 Milagro Blanco from La Mancha, Spain is now available at Just Fine Wine. If you pre-ordered this limited edition, please drop into the shop so that we may take care of you. LE17 Milagro Blanco takes six to eight weeks from start to finish so this wine should be ready in plenty of time for the patio season. REGION: LA MANCHA, SPAIN – La Mancha is steeped in history and is believed to have been producing wine since the Roman empire. A challenging place to grow grapes, the region is found in hot and dry central Spain, south east of Madrid where the rivers provide much needed water. Hard working vines planted in water-absorbing limestone and chalk sub-soil produce grapes that boast concentrated flavours that burst on the palate. WINE: Muscat, Verdejo and Sauvignon Blanc are wonderful on their own but sing when blended together. Muscat is fruity and crisp, Verdejo has mineral and citrus notes, and Sauvignon Blanc is herbaceous with pleasing acidity. When married, their unique elements create an off-dry, soft, refreshing, fruit-forward wine with a bright bouquet and a complex finish. MILAGRO BLANCO carries notes of passion fruit and white flower on the nose, and is supported by juicy melon, peach, fresh lime and grass with a hint of honey on the palate. The fruity and floral character of this white wine pairs exquisitely with moderately spiced Szechuan, Thai and Vietnamese dishes. Lighter meats like chicken and white fish with green salad dressed in light vinaigrette are natural matches for a fresh, tantalizing meal. 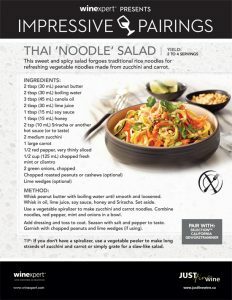 LE17 PAIRING: Spicy Chicken Buddha Bowls. CLICK HERE for Recipe. Just Fine Wine and Winexpert are excited to present to you a spectacular limited release rosé: SELECTION Italian Pink Pinot Grigio. 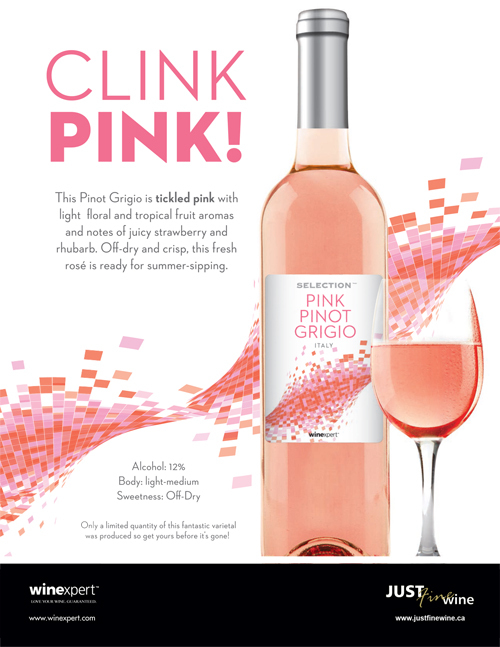 This Pinot Grigio is TICKLED PINK and ready for Summer sipping. Off-dry, crisp and light-bodied with a pale salmon pink hue, this wine presents light apple, pear, floral and tropical fruit aromas that accompany delightful strawberry and rhubarb flavours. Only a limited quantity of this fantastic varietal will be produced and you can reserve yours at Just Fine Wine now until it’s gone – which won’t take long! Each Spring, Winexpert releases a “short run” rosé and the demand for these wines has been steadily growing as wine lovers discover the quality and versatility of blushes. This coupled with the incredible popularity of Pinot Grigio means this wine is destined to sell out…and quickly. Don’t miss out – reserve your batch(es) today! SELECTION Italian Pink Pinot Grigio will be available at Just Fine Wine beginning February 21, 2018 for a limited time only. Ready in only 6-8 weeks and producing 23L (approximately thirty 750ml bottles) of finished wine, SELECTION Italian Pink Pinot Grigio is priced at $185 On-Premise or $130 Kit-Only. Rosé wine has begun to come into its own in recent years and has become a serious style of wine unto itself. Rosés most often offer a lighter, brighter, sunnier take on your favourite red-wine grapes. Like the California Sauvignon Blanc Rosé offered in 2016 & 2017, this year’s release is based on a grape that is most often associated with white wine! Either way, rosés aren’t just for novice wine drinkers. Today’s rosés will please the palate of even the most discerning wine aficionado. Lip-smacking fruit and mouth-watering acidity, lightly chilled rosé wines are versatile and food-friendly. Pale salmon colour with lovely tropical fruit notes joining aromas of light apple, pear and floral. The wine is off-dry and refreshingly light bodied as is typical with most Pinot Grigios. Crisp and refreshing presenting delightful strawberry and rhubarb flavours. A perfect sipping wine and a versatile food pairing partner. Rosé really does go with (almost) everything. SELECTION Pink Pinot Grigio has some residual sweetness making it a perfect partner for spicier fare. It’s also a great match for light salads, shellfish and other seafood, goat’s cheeses, chicken, and pork. February is here and with it comes the release of LE17 New Zealand Hawke’s Bay Merlot. These wine kits are in-stock at Just Fine Wine, ready to start on-premise or to pick up and take away for home vintners. If you pre-ordered this wine, please drop into the shop in order to get yours under way. 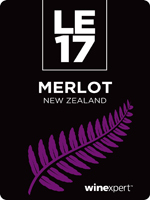 February is here and with it comes the release of LE17 New Zealand Hawke’s Bay Merlot. These wine kits are in-stock at Just Fine Wine, ready to start on-premise or to pick up and take away for home vintners. If you pre-ordered this wine, please drop into the shop in order to get yours under way. Once started, it’s only a quick 6 to 8 week wait until this splendid Merlot is ready to bottle. For anyone who missed the pre-order deadline or for those who are interested in topping up their orders, we have an extremely limited number of “overstock” kits available for purchase. Act fast, these extras are available on a first come, first served basis and are only available while quantities last. REGION: HAWKE’S BAY, NEW ZEALAND – Hawke’s Bay is the oldest wine producing region in New Zealand. The diverse volcanic earth varies between gravel, sand and clay offering an ideal environment for the vineyards flooding the hillsides and banks along the five rivers winding through the landscape. Hawke’s Bay’s beautiful climate presents a lot of sunshine and pleasant conditions year-round. The result is a region that produces some of the finest wines in the country and MERLOT contributes to this well-earned reputation. pair? Try Gouda or smoked cheddar. LE17 PAIRING: Balsamic Lamb with Burst Tomatoes. CLICK HERE for Recipe. Bold and assertive. Strength and structure. Eclipse FORZA is back and here to stay! Bold and assertive with strength and structure, Eclipse FORZA quickly became an immensely popular “short run” offering back in 2015. Now it’s back and here to stay! FORZA, which means strength in Italian, is a bold red blend from Veneto, Italy. It’s a spectacular partnership of Corvina, Sangiovese and Barbera and includes grape skins for added depth. 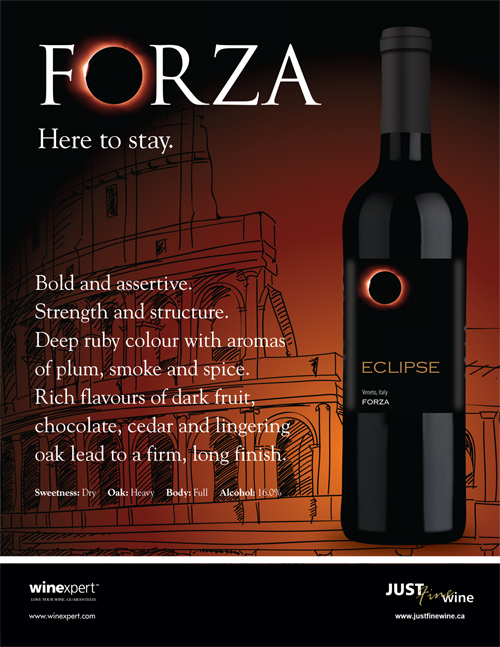 Due to overwhelming popular demand, Winexpert has secured a regular supply of superb, quality juice to ensure Eclipse FORZA will be available on an ongoing, year-round basis. FORZA’s return will coincide with the total lunar eclipse happening January 31, 2018. Ready in 8 weeks, this wine kit will produce approximately 23L of finished wine (roughly thirty 750ml bottles) and is priced at $209 On-Premise or $160 Kit-Only. Available now, contact Just Fine Wine to secure yours today! Located in Northeast Italy, just North of Venice, the Veneto stretches across most of the northern reaches of the Adriatic Sea. The Veneto is known to experience hot summers and cool winters, and thanks to its proximity to the sea, less extreme weather than other Northeastern regions. Silty, sandy soil prevails throughout the Veneto, with influences of clay and calcareous debris. The Veneto produces the most wine in volume in Northeast Italy.THE WINE: Deep ruby colour with aromas of plum, smoke and spice. Rich flavours of dark fruit, chocolate, and cedar with lingering oak and a firm, long finish. Now that we have navigated through the dark and dreariness of the “January Blahs”, it’s time to start focusing on Spring, Summer and patio season! Just Fine Wine and Winexpert invite you to refresh your patio by pouring a glass of these cocktail-inspired wines:NEW Island Mist Peach Bellini, NEW Island Mist Mango Mai Tai, and returning favourite Island Mist Hard Pink Lemonade. All three styles are available for a very limited time only! Now that we have navigated through the dark and dreariness of the “January Blahs”, it’s time to start focusing on Spring, Summer and patio season! Just Fine Wine and Winexpert invite you to refresh your patio by pouring a glass of these cocktail-inspired wines: NEW Island Mist Peach Bellini, NEW Island Mist Mango Mai Tai, and returning favourite Island Mist Hard Pink Lemonade. All three styles are available for a very limited time only! Island Mist Peach Bellini features mouthwatering flavours of juicy peach, white apricot, prosecco and rum. Island Mist Mango Mai Tai presents a tantalizing combination ripe mango, pineapple, orange, rum and amaretto. All three of these Island Mists are delicious and super refreshing. These three styles are 7.5% alcohol by volume and have a sweetness code of 5. Each kit produces 23L (approximately thirty 750ml bottles) of finished beverage and are priced at $130 On-Premise or $75 Kit-Only. Don’t miss out on this opportunity to refresh your patio this Spring/Summer. 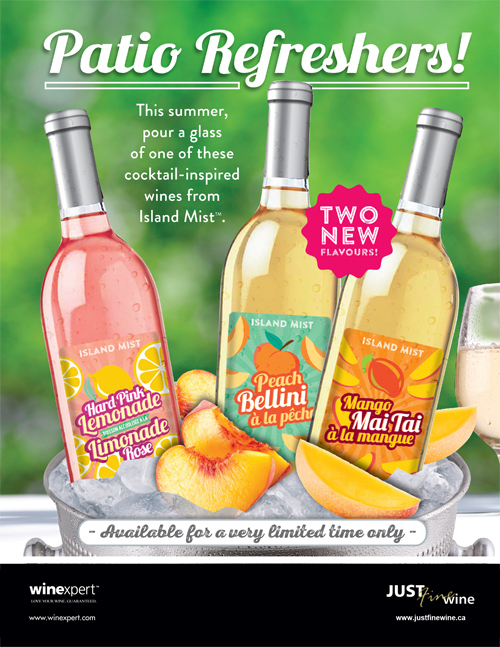 Island Mist Peach Bellini, Island Mist Mango Mai Tai, and Island Mist Hard Pink Lemonade are extremely limited in quantity and are available on a first come, first served basis beginning in March 2018. So act fast to ensure you don’t miss out! Just Fine Wine and Winexpert are happy to announce a brand new addition to the Island Mist series: Blood Orange Sangria.Sweet and citrusy notes of juicy blood orange and ripe peach blend with crisp apple undertones for the perfect summer wine – fruity, refreshing and easy drinking. 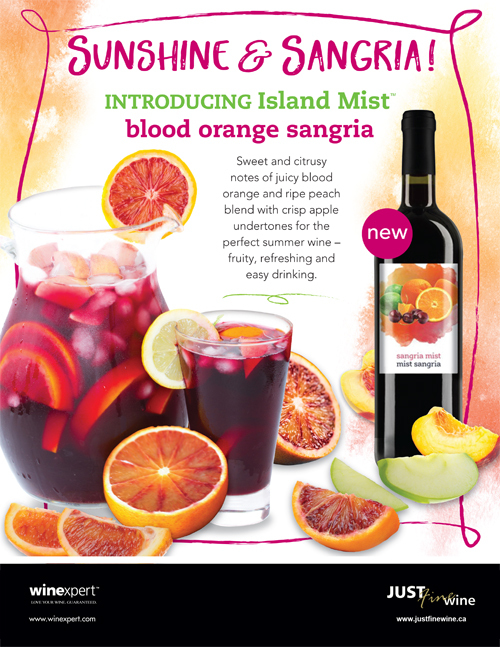 While we are still in the grips of Winter, Spring is on the horizon so what better time for Just Fine Wine and Winexpert to announce a brand new addition to the Island Mist series: Blood Orange Sangria. This Island Mist style is ready for the warmer weather and is sure to become a year-round favourite. Sweet and citrusy notes of juicy blood orange and ripe peach blend with crisp apple undertones for the perfect summer wine – fruity, refreshing and easy drinking. Sip slightly chilled, try with added fruit, or enjoy over ice topped with sparkling water for a refreshing Summer spritzer – there are countless ways to diversify your Island Mist. NEW! Island Mist Blood Orange Sangria produces 23L (approximately thirty 750ml bottles) and is ready in four short weeks. Prices are $125 for batches made on-premise or $70 kit-only for the home vintner. Available at Just Fine Wine beginning February 19, 2018. Order yours today so you will be ready to enjoy the amazing combo of sunshine & sangria! 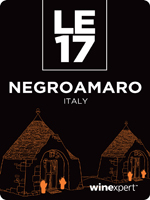 January’s LE17 Wines Available Now! 2016 is off and running and as usual we’re kicking off the new year in style with the release of the first two LE15 styles: Barbera from Piedmont, Italy and PInot Grigio Verduzza from Veneto, Italy. 2018 is out of the blocks and so far is going by as quickly as last year did. 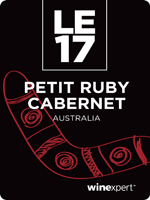 With the turn of the calendar also comes the release of the first two LE17 vintages: Petit Ruby Cabernet from Riverland, Australia and Chardonnay Chenin Blanc from Rawsonville, South Africa. These wines are in-stock and ready to start (or pick up for all of you home winemakers) at Just Fine Wine. If you placed a pre-order for one or both of these wines, please drop into the shop (if you have not done so already) and we can get yours underway. Then it’s just a short 8 week wait until you will be enjoying these fantastic Limited Editions, and that time will go by faster than any of us think! REGION: RIVERLAND, AUSTRALIA – In the Lower Murray oasis of south Australia you will find the Riverland. Spanning across Victoria and New South Wales, and basking in the continental climate, bountiful vineyards ripen during the sunny dry days of the season, while the Murray River winds through this unofficial “super zone” providing much needed irrigation. WINE: A true gem, PETIT RUBY CABERNET is a blend of Petit Verdot and Ruby Cabernet. The Ruby Cabernet takes the best qualities of its parents, Cabernet Sauvignon and Carignan, creating a structured, robust wine with soft tannins, while the Petit Verdot brings intriguing flavours of dark berries and vanilla. Elegant fruit flavours of currant, juicy plum and dark berries complemented by notes of spicy ground black pepper with hints of herb and vanilla, make this medium-full bodied wine a delight to enjoy with grilled meats.Try it with succulent rib eye steak for a wonderful weekend treat, or barbecue burgers for an equally delicious pairing. Having an Italian night and want to switch up the wine? PETIT RUBY CABERNET is delicious with classics like meat lover’s pizza and spaghetti Bolognese. LE17 PAIRING: Ruby Rigatoni Bolognese. CLICK HERE for Recipe. REGION: RAWSONVILLE, SOUTH AFRICA – Permeating the white wine world, CHARDONNAY is refreshing to layer with lesser known varietals like CHENIN BLANC, South Africa’s signature white. Grapes from the Rawsonville region, a small picturesque wine growing and farming community on the eastern flanks of the Du Toitskloof Mountains in the Western Cape province, make up this blend. The Mediterranean climate brings cool rainy winters and warm dry summers to the vineyards creating a fruit driven white wine with a high but pleasant natural acidity. The thin-skinned grapes soak in rays of sunshine to ripen and are carefully picked at just the right time to leave a crisp and bright juice. WINE: Carrying distinct cultivar characteristics, tropical fruit aromas marry with baked apple citrus zest and juicy peach. On the palate, the buttery complexity of CHARDONNAY is complemented by CHENIN BLANC’S tart acidity to make a beautifully balanced wine. Delicious to sip on its own or to enjoy with food, this is a crowd-pleasing and unique addition to any cellar. Enjoy with a variety of seafood dishes like grilled shellfish or salmon fish cakes. If feeling decadent, try chicken poached in a butter sauce, as the wine’s bright acidity and fruity character will complement the richness of the sauce wonderfully. LE17 PAIRING: Artichoke & Spinach Chicken Pot Pie. CLICK HERE for Recipe. 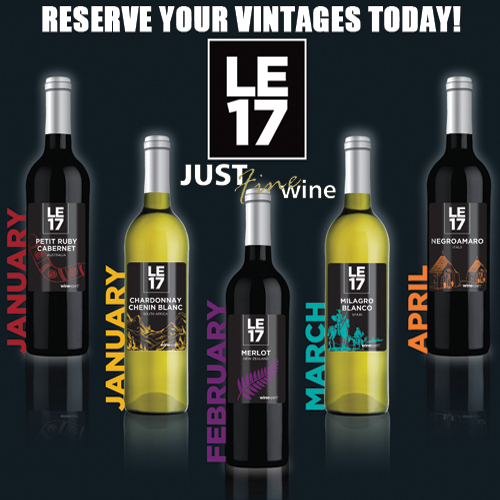 Reserve Your LE17 Vintages Today! Together, Just Fine Wine and Winexpert are extremely proud to present to you the LE17 Collection: a showcase of five remarkable wines from five remarkable wine-growing regions. The LE17 collection is a welcome showcase of popular varietals and unique blends. This vintage collection offers something to appeal to every wine lover (scroll down for complete wine by wine descriptions). Fruit driven, spicy, floral or herbaceous; whatever your preference, these wines will awaken your palate. This year, superior quality juice has been sourced from: Riverland, Australia; Rawsonville, South Africa; Hawke’s Bay, New Zealand; La Mancha, Spain; and Apulia, Italy; producing five magnificent wines that will compliment any wine cellar. 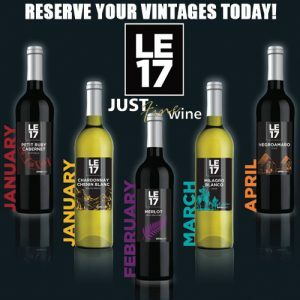 LE17 vintages are available by pre-order only for a limited time and will be released on a month to month basis from January through April 2018. No deposit is required; however, to be able to continue this we ask that you honour your entire pre-order commitment. Pre-order deadline is December 2, 2017. All LE17 wine kits produce approximately 23L (roughly thirty 750ml bottles) of finished product and are priced at $189 On-Premise and $134 Kit -Only (Grape Skin Kit is $205 On-Premise and $150 Kit-Only). Submit your order today and avoid missing out on these fantastic wines! In Person: Join us at our LE17 Wine Tasting, taking place Sunday, October 29, 2017 at Port Coquitlam’s Wilson Centre. CLICK HERE for full event details. If you are unable to attend, you can also fill out your DOWNLOADABLE ORDER FORM and bring it to Just Fine Wine. an equally delicious pairing. Having an Italian night and want to switch up the wine? PETIT RUBY CABERNET is delicious with classics like meat lover’s pizza and spaghetti Bolognese. moderately spiced Szechuan, Thai and Vietnamese dishes. Lighter meats like chicken and white fish with green salad dressed in light vinaigrette are natural matches for a fresh, tantalizing meal. REGION: RIVERLAND, AUSTRALIA – Bellissimo Italia…delightful wine, delicious food and stunning sun-soaked landscapes. Apulia (or Puglia in native Italian) exemplifies all of these things and more. Explore Apulia, the heel of Italy’s boot and follow one of the longest coastlines of any wine region in the country. The Mediterranean Sea graces the region’s vineyards with cooling winds maintaining ideal temperatures for growing. Sunny, warm and dry with some of the most fertile soil in Italy, the area offers the perfect environment for ripening grapes as well as olive trees and wheat fields that coexist with vineyards in this agricultural centre. LE17 Pre-order deadline is Saturday, December 2, 2017. So how do you know what the LE varietals will taste like if you have to order before the kits are even made? Take advantage of an opportunity to sample ‘commercial equivalents’ of the LE17 wines in advance of the pre-order deadline at Just Fine Wine’s LE17 Wine Tasting taking place October 29, 2017. Join us for an enjoyable afternoon filled with fun, food, and of course, wine! This casual and entertaining event also features the one and only Tim Ellison – come find out for yourself why popular demand is bringing him back for a sixth straight year! Each year Winexpert produces a limited quantity of five fabulous and unique varieties from around the world that are released monthly from January through April. LE wines vary year to year and can be one or a combination of the following: unique blends, hot industry trends, highly sought after regions and vineyards; and scarce or hard to obtain grapes/juice. One thing remains from one year to the next, LE collections always produce wine of superior quality. LE vintages are available only during the month of their release. They are limited in supply and are so immensely popular that they can be acquired by pre-order only. The LE program has built a reputation of delivering exceptional, award-winning wines year after year after year. This speaks to the high quality wines that these very special wine kits produce and that’s why LE continues to be the biggest most successful limited release brand. Each and every year, LE wines are awarded medals at the WineMaker International Amateur Wine Competition; a testament to the superior quality of our LE program. 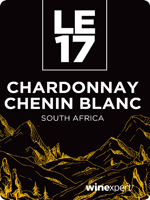 We’re confident LE17 will continue the award-winning tradition; will you be one of the award-winning winemakers? Just ask Just Fine Wine for more information. Get Your Tickets To The LE17 Wine Tasting Now! Every year, Winexpert produces a limited number of exclusive 8-week wine kits. There are three reds and two whites to choose from and the the varietals /styles change from year to year. The wine kits are released on a monthly basis beginning in January. 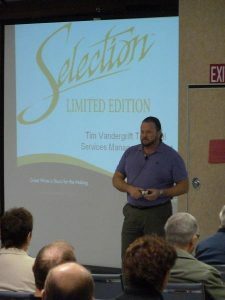 Beyond limited availability, there are a number of other factors that make these wines so exceptional: they can range from unique blends to hot industry trends to rare, hard to obtain and sought after varietals and regions. The main thing to note is that these spectacular wines are produced in limited quantity and are available by pre-order only. What is Just Fine Wine’s LE17 Wine Tasting? A challenge with LE wines is that they have to be pre-ordered before they are produced – so how are we to know what the wines will taste like? You can find out for yourself at Just Fine Wine’s LE17 Wine Tasting, taking place 3pm to 5pm on Sunday, October 29, 2017 at the Wilson Centre in Port Coquitlam. 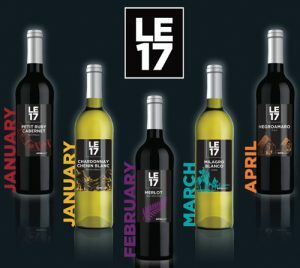 Using ‘commercial equivalents’ (wines purchased from a licensed BCLDB retailer), you can get an exclusive sneak preview of the LE17’s months before they hit the shelves. Commercial equivalents for the event are carefully selected to to give you a strong overall impression of what your Winexpert LE17’s will taste like, in advance of their production. Past attendees will attest that as good as some of this commercial wine is, the wine you will craft is always better! Just Fine Wine’s LE17 Wine Tasting is an entertaining afternoon spent in the company of fellow wine enthusiasts. It’s casual, comfortable, enjoyable, and most certainly not “hoity toity”. In addition to enjoying tasty wines, you also get to sample professionally prepared food pairings that are tailored specifically for each of the LE17 wines. You can experience firsthand how great wines can be taken to an even higher level when complimented with just the right food pairing. Finally, let’s not forget about an entertaining and informative expert on wine & food to moderate the afternoon. Just Fine Wine has been holding it’s annual Limited Edition Wine Tasting for many years but for the past five years we have had overwhelmingly positive feedback to our moderator and constant demand for his return. Who are we to object? For the sixth straight year, we couldn’t be any happier to announce that the incomparable Tim Ellison will once again be at the helm, hosting the afternoon. Tim is Canada’s only Certified Chef de Cuisine and Sommelier that also holds the prestigious WSET Diploma of Wine & Spirits. He is the Director of Food & Beverage Service at the prestigious Vancouver Club. Most importantly, he’s hugely entertaining and makes learning about wine an extremely enjoyable experience! Tickets are $15 and available now at Just Fine Wine. LE17 – CLICK HERE FOR DETAILS! This fall Just Fine Wine and Winexpert will be offering three delicious, Limited Release Après Dessert Wines (Ports*). Originally released in 2007 and back every year since by popular demand is Après Chocolate Raspberry Dessert Wine. In addition to this classic, popular demand has also brought back Après Chocolate Salted Caramel Dessert Wine, after a year hiatus. Rounding out the trio is the brand new Après Toasted Marshmallow Dessert Wine. Après Chocolate Raspberry Dessert Wine, Après Chocolate Salted Caramel Dessert Wine, and Après Toasted Marshmallow Dessert Wine take 8 weeks to produce 11.5L (approximately thirty 375ml bottles or fifteen 750ml bottles) of finished product. They are priced at $149 On-Premise ($255 for a double batch) or $104 Kit-Only. These three Après Dessert Wines are available at Just Fine Wine beginning August 30, 2017. You can pre-order through the shop to guarantee availability. The timing is just right to have this wine ready for the Holidays. Bottles of these limited offerings make for perfect gifts and giveaways. They are also excellent for sharing with friends, family, and co-workers; to bring as a gift for party hosts; or to serve to guests of your own. Sip after dinner or informally around the Christmas tree or fire. Contact Just Fine Wine today to secure your’s today. This wine is bursting with rich, intense flavours and aromas. The traditional Port character of warm, rounded cherries and plums is supported by a racy zing of bright raspberry. Perfumed and gently tart, with a luscious liquid chocolate rush in the middle of the palate it finishes with beguiling dark, bittersweet aromas of coffee, vanilla, and toast, all the way to a long, rich finish. Excellent on its own or with any dessert, or serve with toasted nuts or shortbread. Superb within a few months, this wine will age gorgeously. After a year hiatus, Chocolate Salted Caramel Dessert Wine is also back by popular demand. The velvety decadence of chocolate blends beautifully with rich, salted caramel. This one ages beautifully. The new kid on the block but sure to be a massive hit. Rich and smoky toasted marshmallow with smooth vanilla and decadent caramelized notes. We can’t wait! Are you looking for the perfect accompaniment to your favourite wine? Are you interested in learning more about what wine complements what cuisine? If yes, then we’ve got just the feature for you: “Impressive Pairings” from Just Fine Wine and Winexpert. This month’s recipe and pairing features Mushroom Crostini partnered with limited release World Vineyard The Candidate Red. Grapes picked at night, Wine Lover’s delight.. Introducing NEW Limited Release Eclipse NOCTURNAL. A new Eclipse is here. But just like the real thing, this rare phenomenon can only be experienced for a short time. Following in the footsteps of the incredibly popular Eclipse FORZA (2015) and Eclipse BRAVADO (2016), Just Fine Wine & Winexpert are pleased to announce NOCTURNAL from Languedoc, France. NOCTURNAL is a classic blend of Grenache, Syrah, Mourvèdre and Cinsaut, with an unusual moonlit twist. The grapes were plucked from the vines in the cool of the night when sugar levels are more stable and acid levels are better. This results in a wine with richer flavour and aromatics. NOCTURNAL has a captivating palate of plum, black raspberry and woodsmoke and the wine kit also includes grape skins for added depth and flavour. Winexpert has secured a limited supply of juice for this amazing French blend. Like the FORZA and BRAVADO before it, once it’s gone, it’s gone. NOCTURNAL can be ordered now at Just Fine Wine and will be available in-store beginning July 12th and until quantities run out. Ready in 8 weeks, this wine kit will produce approximately 23L of finished wine (roughly thirty 750ml bottles) and is priced at $219 On-Premise or $170 Kit-Only. Contact us to secure yours today! T HE REGION: LANGUEDOC, FRANCE. Blends reign supreme in Languedoc, a large coastal wine region in the south of France which stretches from the Rhône valley in the east to the Spanish border in the south west. A wide variety of grapes grow well in the exquisite Mediterranean climate and fertile soil. 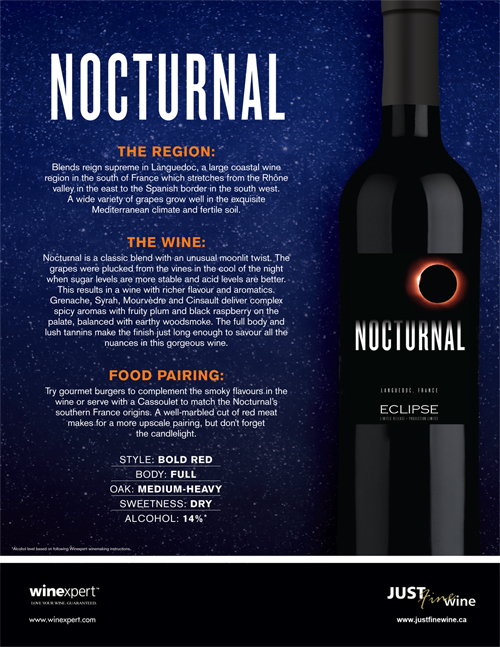 THE WINE: NOCTURNAL is a classic blend with an unusual moonlit twist. The grapes were plucked from the vines in the cool of the night when sugar levels are more stable and acid levels are better. This results in a wine with richer flavour and aromatics. Grenache, Syrah, Mourvèdre and Cinsaut deliver complex spicy aromas with fruity plum and black raspberry on the palate, balanced with earthy woodsmoke. The full body and lush tannins make the finish just long enough to savour all the nuances in this gorgeous wine. FOOD PAIRING: Try gourmet burgers to complement the smoky flavours in the wine or serve with a Cassoulet to match the Nocturnal’s southern France origins. A well-marbled cut of red meat makes for a more upscale pairing, but don’t forget the candlelight. We here at Just Fine Wine are truly appreciative of the continued support of our incredibly loyal clients. It’s time again to thank each and every one of you during our annual Anniversary & Client Appreciation Celebration. We here at Just Fine Wine are truly appreciative of the continued support of our incredibly loyal clients. It’s time again to thank each and every one of you during our annual Anniversary & Client Appreciation Celebration. Once again this year, our biggest sale event of the year will span two weeks! It will all culminate on Saturday, July 8th with our traditional BBQ Open House that many of you have come to look forward to. We would like to extend an invitation you, your family, and your friends to join us. The discounts and prize draws will be available for the entire 11 days, while the July 8th BBQ Open House will also feature free hot dogs, snacks, and light refreshments, All are welcome; even if you don’t need wine, please stop by to relax for a moment, fill out an entry ballot for the prize draws, and grab some lunch on us (on the 8th). We look forward to seeing you! Supplies are limited. While quantities last! We want to thank all of our clients, old and new, for consistently choosing Just Fine Wine and we look to enjoying our June 26th to July 8th Anniversary & Client Appreciation Celebration with you! * Sale discounts/promotions are valid June 26th to July 8th, 2017 only, are not compounding, and are not valid in conjunction with any other sales, discounts or promotions. Pink Moscato: Sip, Smile, Repeat. Featuring a brand new look with the same fresh flavours of strawberry, raspberry and cherry you loved last year. Pink Moscato is light and refreshing on the palate making it great on its own or the perfect complement to fresh fruit kabobs, spicy BBQ dishes, chinese takeout and sweet desserts. Perfect for Summer (and any time for that matter), World Vineyard California Pink Moscato is a 6 week kit that produces 23L (approximately thirty 750ml bottles) of finished wine and is priced at $140 On-Premise or $90 Kit-Only. Available for a limited time only at Just Fine Wine beginning in May. See what all the fuss is about, get yours today before they’re gone! Refresh your patio this Summer with New Island Mist Hard Blueberry Lemonade and Summertime favourite Hard Pink Lemonade! Even though it may still be Winter, It’s time to start thinking about refreshing your patio this Summer. And we have just the thing to help you: NEW Island Mist Hard Blueberry Lemonade and Summertime favourite Hard Pink Lemonade. Both are available for a very limited time only! Coming this March, Hard Blueberry Lemonade and Hard Pink Lemonade both have just the right balance of sweet and tart. These Island Mists are delicious and super refreshing. Hard Pink Lemonade offers up the flavour of freshly squeezed lemons that makes for the classic taste of pink lemonade…with a kick! NEW Hard Blueberry Lemonade combines the refreshingly tart taste of fresh lemons with a kiss of sweet and juicy blueberries. Both styles are 7.5% alcohol by volume and have a sweetness code of 5. Each kit produces 23L (approximately thirty 750ml bottles) of finished beverage and are priced at $125 On-Premise or $70 Kit-Only. These mouth-watering Island Mist flavour creations are extremely limited in quantity and are available on a first come, first served basis beginning in March 2017. So act fast to ensure you don’t miss out! Just Fine Wine and Winexpert are pleased to announce the return, and FINAL APPEARANCE, of a spectacular limited release rosé from California: SELECTION Sauvignon Blanc Rosé. This lovely rosé features tropical notes of pineapple and white peach with raspberry and cherry. The off-dry finish is balanced by expressive acidity for a refreshing, crisp wine that’s great on its own and pairs beautifully with so many foods. Enjoy it this summer with just about anything including: fresh seafood, chicken or pork dishes, slightly spicy foods and sushi. Only a limited quantity of this fantastic varietal was produced and this is your last opportunity to make this particular rosé. Be sure to order yours before it’s gone! SELECTION California Sauvignon Blanc Rosé is available at Just Fine Wine beginning March 1, 2017 for a limited time only. This wine proved to be incredibly popular last year so don’t miss out – reserve your batch(es) today! Selection California Sauvignon Blanc Rosé is a 6-8 week kit that produces 23L (approximately thirty 750ml bottles) of finished wine and is priced at $185 On-Premise or $125 Kit-Only. Rosé wine has begun to come into its own in recent years and has become a serious style of wine unto itself. Rosés most often offer a lighter, brighter, sunnier take on your favourite red-wine grapes. This year’s release is based on a white wine grape! Either way, rosés aren’t just for novice wine drinkers. Today’s rosés will please the palate of even the most discerning wine aficionado. Lip-smacking fruit and mouth-watering acidity, lightly chilled rosé wines are versatile and food-friendly. Grown in a classic Mediterranean climate featuring warm days and cool evenings, the region’s steady breezes provide the grapes with natural air conditioning throughout the growing season. This perfect climate produces wines with beautiful aromatics and refreshing natural acidity. Pale salmon colour with lovely tropical notes of pineapple and white peach with raspberry and cherry. The wine is off-dry but the vibrant acidity balances it out. Full and juicy, a crisp and refreshing finish makes this a perfect sipping wine. Rosé really does go with (almost) everything. This particular rosé has some residual sweetness making it a perfect partner for spicier fare. It’s also a great match for seafood, chicken and pork. Just Fine Wine and Winexpert are happy to announce a brand new addition to the Island Mist series: Apple Berry Syrah. Aromatic and fresh, Island Mist Apple Berry Syrah’s mouthwatering flavours of juicy apples, succulent strawberries, plump blueberries, and ripe raspberries will give you that fresh-from-the-fruit-stand feeling all year long. Sip slightly chilled or enjoy over ice topped with sparkling water for a refreshing Summer spritzer that’s always in season. NEW! Island Mist Apple Berry Syrah is a 4 week kit that produces 23L (approximately thirty 750ml bottles) of finished wine and is priced at $125 On-Premise or $70 Kit-Only. Available February 22, 2017. This month’s recipe and pairing features Lamb Sliders partnered with smooth, full-bodied Cabernet Sauvignon. This month’s recipe and pairing features Orange Date Squares partnered with Spéciale Red Velvet Port. Just Fine Wine and Winexpert aim to raise the bar each year with the LE program and LE16 is no different. Together, we are extremely excited to present to you the LE16 Collection: a showcase of five outstanding wines from some of the world’s most renowned regions. Winexpert has sourced superior quality juice from Washington State, Italy, Spain, California, and Australia to bring you five impressive wines that will be a welcome addition to your cellar. 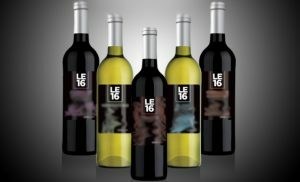 The LE16 collection offers something for every palate (scroll down for complete wine by wine descriptions). This year, in addition to sought-after varietals and unique blends, we are thrilled to offer a very distinctive wine – Blanc de Noir – an elusive white wine that is made from red grapes! Done in an off-dry style, this is the must-have wine of the year and is sure to be a hit with those lovers of Pacific Quartet. LE16 vintages are available by pre-order only for a limited time and will be released on a month to month basis from January through April 2017. No deposit is required; however, to be able to continue this we ask that you honour your entire pre-order commitment. Pre-order deadline is December 3, 2016. All LE16 wine kits produce approximately 23L (roughly thirty 750ml bottles) of finished product and are priced at $185.00 On-Premise* and $125.00 Kit -Only* (Grape Skin Kit is $195.00 On-Premise and $135.00 Kit-Only). R.S.V.P. with your order today to avoid missing out on these fantastic wines! In Person: Join us at our LE16 Wine Tasting, taking place Sunday, October 16, 2016 at Port Coquitlam’s Wilson Centre. CLICK HERE for full event details. If you are unable to attend, you can also fill out your DOWNLOADABLE ORDER FORM and bring it to Just Fine Wine. REGION: YAKIMA VALLEY, WASHINGTON – Cabernet Franc is a grape with so much to offer, yet most of the winemaking world blends it with other varieties to make a ‘Bordeaux’ style blend. It’s home, the Loire Valley in France, is one place that hails Cabernet Franc for the beauty that it is and makes brilliant single varietal versions of it. The Yakima Valley in Washington state ironically sits at the same latitude as the Loire Valley. These cooler climate wine regions have just what Cabernet Franc is looking for. At 46 degrees latitude north, grapes ripen in summer sunshine that lasts for about 17 hours a day (more than in California) and Yakima specifically is known to have 300 cloudless days per year. WINE: There’s good reason to celebrate this grape on its own. It can tread the line between fruit and spice notes magnificently with ripe raspberry and red currant dancing around with black pepper and fresh mint leaf. There is a solid backbone of tannin to provide mouth-feel and structure, and it can pair with a range of foods due to its medium-full body status. Play up the herbaceous elements and enjoy it with rosemary-crusted lamb or cozy up in the winter with a paprika-rich bowl of Goulash stew. LE16 PAIRING: Steakhouse Panzanella Salad. CLICK HERE for Recipe. REGION: TUSCANY, ITALY – In Tuscany, the grape gets a chance to soak in the warm amber hues of the Tuscan sun. This ripens it to a degree that lends to even more aromatic expression on both the nose and palate. Tuscany, arguably one of the finest wine regions in the world, certainly has a definitive collection of red grapes already. However Vermentino is one of the few whites grown in this haven of viticulture and we’re grateful for it. WINE: Although rare in North America, in Italy the Vermentino grape is a white star. Grown from the north to south of the country, it ferments into a wine that is expressively refreshing. Think of flavours like white peach, green apple, fresh lime and even a bit of dried tarragon on the finish. On the palate, it has a quenching acidity that makes your mouth water with delight and a delicate weight that allows this wine to be sip-worthy on its own. Although perfect on its own on a warm summer day, this wine also pairs beautifully with regional Italian cuisine like pasta tossed in olive oil with fresh shellfish or simply with grilled Mediterranean vegetables. LE16 PAIRING: Turkey Picatta. CLICK HERE for Recipe. REGION: VALENCIA, SPAIN – Most of the vineyards in Valencia are located inland where there is more mountainous topography. This allows the grapes a much-needed cool down in the evening from the warm heat that surrounds them during the day. This particular area of the country has a long history of making wine, dating as far back as the Neolithic period which certainly gives them an anchor in expertise and tradition. WINE: Blending grapes together is an art, with of course a bit of science, and the grapes here are perfectly suited. Three of Spain’s great red varieties, Tempranillo, Garnacha and Bobal bring their lush and hedonistic qualities to pair the full-bodied and well-structured friends Cabernet Sauvignon and Syrah. Together, you have a wine with a range of black and red fruit characteristics, cherry cola, anise and white pepper and a powerful yet supple mouth-feel. Pair this with braised beef, a big wedge of Manchego cheese, or the region’s famous specialty, Paella. Put your feet up, close your eyes and escape to Spain. LE16 PAIRING: Chicken & Chorizo Paella. CLICK HERE for Recipe. REGION: SAN JOAQUIN VALLEY, CALIFORNIA – The San Joaquin Valley is California’s largest wine region, and for a good reason. This area is an agricultural haven and is known as the “food basket of the world”. Grapes just thrive here and are so content to grow that you can taste their utter bliss in the juice. With over 100 years of winemaking history, producers have been pushing the quality boundaries and the region is now being known for its varietal focus. WINE: Blanc de Noir is a French term that translates to a white wine made from dark grapes. Pinot Noir, which many wine experts argue is the greatest red wine grape in the world, is used for this particular wine. Normally quite a fussy character, Pinot Noir is notably difficult to grow. However, with those deep fertile soils of the San Joaquin Valley and the cool Delta breeze that flows through the vineyards, Pinot Noir is quite content here. By quickly removing the skins from the juice after the grapes have been pressed, the pigment from the skins is not transferred to the juice and you have all the beautiful complexities of Pinot Noir while keeping the colour light and the tannins at bay. This wine, with its crab apple and strawberry driven nose and white peach and grapefruit palate pairs well with delicate dishes. Splurge on poached lobster or enjoy with eggs benedict for your next Sunday brunch. LE16 PAIRING: Honey-Soy Glazed Lobster Tails. CLICK HERE for Recipe. REGION: RIVERLAND, AUSTRALIA – Woven around the Murray River, the Riverland is a beautiful region of South Australia, located about 2½ hours north east of Adelaide. Blessed with vast open spaces, the region enjoys a consistent sunny and warm Mediterranean-like climate with long days of sunshine. The result of this agricultural haven is sun-kissed, vibrantly ripened grapes making this an area of the world where big reds can develop to their full potential. WINE: Cabernet Sauvignon, the undisputed “king” of grapes, is a big, bold character that has strong tannins in his youth, yet unwinds himself with age to a smooth, velvety texture that is worth waiting for. Flavours like black currant (cassis) jam, cigar box and black olive will arise and marry well with his counterpart Grenache. Grenache is the yin to Cabernet Sauvignon’s yang. It’s both soft and jammy to balance out the powerful structure of Cabernet, yet rich and spicy enough to stand up to him. Flavours like red licorice, black cherry and raspberry combine with warm vanilla and spice that rounds out the blend perfectly. Enjoy this wine with bold protein-rich dishes like grilled steak on the barbecue or wild mushroom risotto if meat is not on the menu. Even without a meal, have a few big slices of aged cheddar to compliment the flavour and tannin of this age-worthy red. LE16 PAIRING: Beef Tenderloin with Mushroom-Barley Risotto. CLICK HERE for Recipe. LE16 Pre-order deadline is Saturday, December 3, 2016. So how do you know what the LE varietals will taste like if you have to order before the kits are even made? Take advantage of an opportunity to sample ‘commercial equivalents’ of the LE16 wines in advance of the pre-order deadline at Just Fine Wine’s LE16 Wine Tasting taking place October 16, 2016. Join us for an enjoyable afternoon filled with fun, food, and of course, wine! 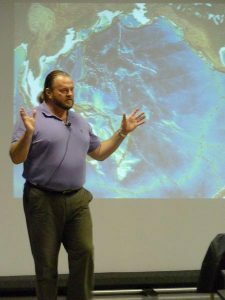 This casual and entertaining event also features the incomparable Tim Ellison – come find out for yourself why attendees have demanded him back for a fifth straight year! LE vintages are available only during the month of their release. They are limited in supply and are so immensely popular that they can be acquired by pre-order only.The LE program has built a reputation of delivering exceptional, award-winning wines year after year after year. This speaks to the high quality wines that these very special wine kits produce and that’s why LE continues to be the biggest most successful limited release brand. In the 2016 WineMaker International Amateur Wine Competition* all five LE14 wines were awarded medals; a testament to the superior quality of our LE program. We’re confident LE16 will continue the award-winning tradition; will you be one of the award-winning winemakers? Just ask Just Fine Wine for more information. This month’s recipe and pairing features Southwestern Pumpkin Hummus partnered with off-dry Riesling. This month’s recipe and pairing features Grilled Tandoori Chicken partnered with off-dry Gewürztraminer. 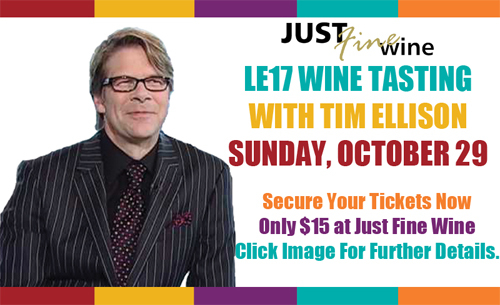 Just Fine Wine’s LE16 Wine Tasting is back Sunday, October 16th and features (for the fifth straight year) the incomparable Tim Ellison! Every year, Winexpert produces a limited number of exclusive 8-week wine kits. Released on a monthly basis beginning in January, there are three reds and two whites to choose from and the varietals change from year to year. Beyond limited availability, there are a number of other factors that make these wines so exceptional: they can range from unique blends to hot industry trends to rare, hard to obtain and sought after varietals and regions. The main thing to note is that these spectacular wines are produced in limited quantity and are available by pre-order only. What is Just Fine Wine’s LE16 Wine Tasting? A challenge with LE wines is that they have to be ordered before they are produced – so how are we to know what the wines will taste like? You can find out for yourself at Just Fine Wine’s LE16 Wine Tasting, taking place 3pm to 5pm on Sunday, October 16, 2016 at the Wilson Centre in Port Coquitlam. Using ‘commercial equivalents’ (wines purchased from a licensed BCLDB retailer), you can get an exclusive sneak preview of the LE16’s months before they hit the shelves. Commercial equivalents for the event are carefully selected to to give you a strong overall impression of what your Winexpert LE16’s will taste like, in advance of their production. Past attendees will know that as good as some of this commercial wine is, ours is always better! Just Fine Wine’s LE16 Wine Tasting is an entertaining afternoon spent in the company of fellow wine enthusiasts. It’s casual, comfortable, enjoyable, and most certainly not “hoity toity”. In addition to enjoying tasty wines, you also get to do sample professionally prepared food pairings that are tailored specifically for each of the LE16 wines. You can experience firsthand how great wines can be taken to an even higher level when complimented with just the right food pairing. Finally, let’s not forget about an entertaining and informative expert on wine & food to moderate the afternoon. Just Fine Wine has been holding it’s annual Limited Edition Wine Tasting for many years but for the last four years we have had consistent, overwhelmingly positive feedback to our moderator and constant demand for his return. Who are we to object? For the fifth year running, we are extremely excited to announce that the incomparable Tim Ellison will once again be at the helm, hosting the afternoon. Tim is Canada’s only Certified Chef de Cuisine and Sommelier that also holds the prestigious WSET Diploma of Wine & spirits. Most importantly, he’s hugely entertaining and makes learning about wine an extremely enjoyable experience! LE16 – CLICK HERE FOR DETAILS!